6:45 AM and it is dark. Damn daylight saving time! Even the Ravens are still in bed. 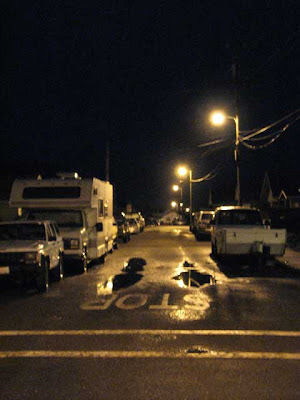 There was a light rain last night so there are puddles along this one-way street between Maple and Willow. 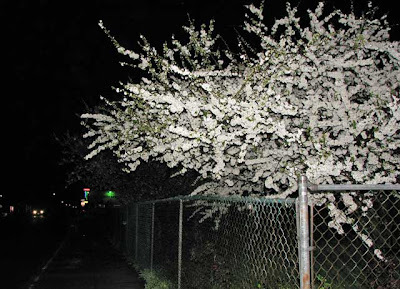 Cherry trees are blossoming but I had to use a flash to see them! Damn daylight saving time! But it will be different this coming Saturday. 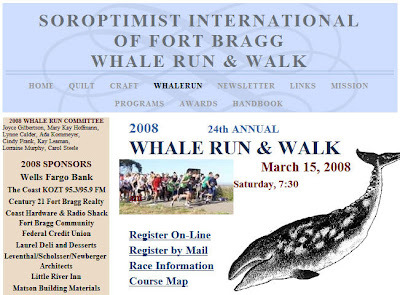 I plan on attending the Whale Run and Walk. I hope to see you there. Here is their website. And, as long as I have your attention.... Anyone have any idea what this plant is? I found it leaning against a mail box last week with a "Free" sign on it. (It is 5' 6" tall.) I brought it home and have spent over an hour Googling it and looking around on Wikipedia. I have looked at cacti and I have looked at succulents. I have also e-mailed friends. No joy! 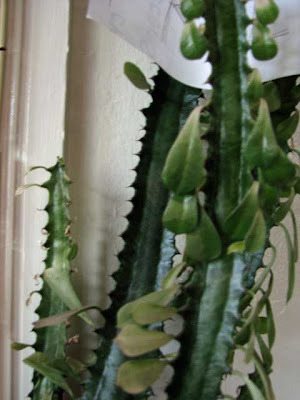 It has two little thorns at the base of each leaf. The main stem has two rows of thorns but the branches have three! Help! I only know this as a crown-of-thorns plant! Nope. It isn't a crown-of-thorns plant. They are a lot "drier" and a lot more stickery. Maybe a species of Euphorbia?